Obverse: Laureate and draped bust of George III right. Text around, incuse on raised rim, GEORGIUS III D:G REX. Reverse: Britannia seated on rocks facing left, with trident in the crook of her left arm, and ivy branch in right hand, being held up, waves at her feet and man-o-war ship in background. To her left is a shield with union jack design. The mint mark SOHO to rock in the foreground. Text, incuse on raised rim, top BRITANNIA., bottom 1797. History: James Watt and Matthew Boulton collaborated in the erection of the first steam driven coining presses, set up at Boulton’s Soho foundry, near Birmingham. In 1797 Matthew Boulton was given the contract to manufacture the first copper pennies and twopenny pieces. 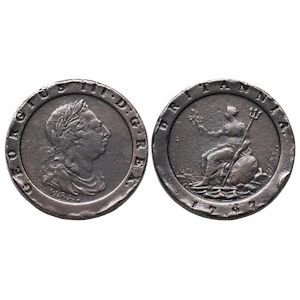 These coins were the first English regal coins to be minted by steam power. The incuse lettering around the broad rim on both sides was intended to foil counterfeiters as well as being a means to reducing wear on the legend. The copper twopences weighed two ounces and, being so large, they soon acquired the name ‘cartwheels’. The ‘cartwheel’ penny of 1797 was still being minted two years later with the date unchanged.